Deeann Rieves contacted me about her work, in my role as a curator, and I immediately loved it and felt connected to it. She powerfully combines realism and abstraction and also works areas of loose free shapes and line with refined careful stitched. The contrast in her work pulls me in and makes me want to stay and learn more. So she seemed like a perfect subject for my next Future Heirlooms. Turns out I was right. So here we go. Meet Deeann. I graduated from Memphis College of Art in 2007 with a painting emphasis and also took many surface design and fiber courses. My last year in school I began to combine these two loves but it honestly took a couple of years for these techniques to officially melt together in my mind and natural way of working. I moved to Nashville after graduating and pursued my artwork full-time with a lot of encouragement from my family to dream big and do something I love for a living. My family is artistic, my dad is a musician and he and my mom have been in ministry my whole life, so they can easily support doing something for a living that you have to really believe in and that isn’t always consistent. I married Loyd in 2009 and he is also a musician, which I am grateful for, because we totally understand each other’s work methods and melancholy personalities. Your work often combines medium and technique can you talk about the role of the different materials and processes? I use collage, torn paper, vintage lace, fabric, pastels, and paint on almost every piece. 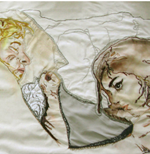 I incorporate machine embroidery on fabric, paper, or Sulky Solvy (a water-soluble stabilizer for machine embroidery). When I use the Sulky for machine embroidery, it is often hard to control, which also relates conceptually to the work. The series is about the coverings we make for ourselves when we aren’t being genuine and how hard we try to control what appears on the surface versus being completely vulnerable, willing to lose control, and spilling it all out. In relationship to the above question how do you decide your process for each piece? For me the process often relates to the piece conceptually, in my piece Walls Crumble I literally ripped and tore pieces from the surface and let them sag and adhere them to the bottom of the piece like they were falling down. The covering called Pieced Together was literally separate pieces that were sewn together. This series was challenging because there were so many types of pieces I would often think of a title way before deciding if the piece would be on wood, paper, or simply be fabric and thread, but I think it makes the series innovative and I hope that it gives my work a versatility that makes it appealing to many different types of people. How does the incorporation of fabric and sewing affect the conceptual aspect of your work? I love how old fabric and vintage laces contribute their own history and they bring another layer to the work aesthetically and conceptually. On your series “Embody” you did work inspired about the females characters in the bible, Can you discuss how spirituality affects your work? My faith is such a large part of who I am that it is a part of everything I do and comes through in subtle ways in all of my work. I grew up in church and became a Christian at a young age, I later worked as a counselor at a camp and almost went into art therapy as a way to use my art to help others. Perhaps some of this is why my work is about people’s stories, feelings, and experiences. Embody was my first professional series and each piece was a narrative, inspired by a woman from The Bible. My work still carries a lot of these themes, but in a different way. For example, Pieced Together was inspired by Eve feeling naked and making a covering for herself with leaves. I don’t think that is obvious when looking at the piece and that is what intrigues to me about it, because anyone can relate to it– our feelings and experiences are the thread that connect us all. You work often skirts the line between narrative and representational and abstract managing to be both simultaneously, can you discuss your attraction to both sides of this? As I progressed towards abstract work that did not include a figure with a story, I still got my inspiration from women in the past, women I know, and how our stories are connected. For example, the piece “Her Tattered Covering” is inspired by a book by Francine Rivers called Redeeming Love, it is a contemporary story of Hosea and Gomer from the Bible. Hosea is instructed to marry a prostitute to signify God’s love and forgiveness for Israel even when they abandoned their faith and went back to their past. Gomer leaves Hosea over and over returning to what she knows and there is a moment in the Redeeming Love where the woman is scrubbing herself raw in the river as she tries to wash away her past. This image stayed with me and I felt like it was directly related to my Spills and Coverings series. I wanted to make a piece that was fragile, raw, tattered, and made up of old lace that would insinuate lingerie. As I sewed the pieces together, they looked like a piece of old clothing but the lace was so brittle it literally ripped as I worked and reminded me of the disintegrated leaves I had been looking at for inspiration. So, I emphasized the torn areas with a dark red thread that looked like it was eating away at the “Covering” which wasn’t really covering anything because you can see right through it. I wanted it to be displayed in a vulnerable raw position so I decided a clothesline would seem very personal, like you were peering into someone’s dirty laundry or their past. Can you discuss how the role of the female informs/inspires your work? I think I began to see the women and their stories as inspiration, but my purpose is no longer telling their stories as narratives. Much of your work starts to become sculptural by 3 dimensionally coming of the wall or spilling onto the floor. What does this sculptural element do for you an an artist and what draws to you push the 2 dimension? Well, the work itself asked to break the boundaries of the traditional canvas. For example, When the Bottom Falls Out began as a normal wood panel and as I worked on the piece and the concept became clearer, it absolutely had to look like the bottom of the painting literally collapsed. My other pieces would slowly progress and I would add paper and fabric pieces that went over the edges until I eventually felt free enough to make a piece on loose canvas with fabric that literally spilled all the way to the floor, Puddles To The Ground. I wanted to have a few pieces that were more like installations in nature so they could emphasize the meaning of the other pieces. In your new work, Spills and Coverings, the work has become more fragile… Can you briefly describe this series to us. Emotionally describe the experience of painstaking making something that looks like it is falling apart. I work on several paintings at once, but one of the first pieces was Holding It Together and I was looking at disintegrating leaves for inspiration when I decided to cut holes into the panels and have thread suspend across the gaps in the cut out areas. After I finished the machine embroidery on Sulky and immersed it in water, it literally barely held it together. That is when I realized how the lines of the thread had so much meaning, not just aesthetically, but because of the process of each individual piece and phrases people use that easily relate to fiber materials — holding on by a thread, unraveling, holding yourself together, etc. How has your work evolved since you first began working with fabric? I feel like my work finally began to be mine when I began use fabric, cut holes in my pieces, and let the panels not be square, like it was a breakthrough of where I was supposed to be going as an artist. Just in the last week or so, I have felt like the Spills and Coverings series is coming to a close and specific pieces will spin-off into new bodies of work. After doing several works on paper like Pulling Away, I have started to keep the work even more airy, leaving more space for the eyes to sort of “rest.” It has been refreshing to me as well because it brings more attention to the delicate embroidery lines. They almost seem like fiber drawings instead of paintings so I think I may run with that idea for a while and begin a few new bodies of work at once. I feel like my personality has a good balance of artistic and melancholy mixed with extremely self-disciplined, logical, good with numbers, I make a lot of lists and goals, and I am extremely organized. This is my fourth year working full-time in the studio, and I decided to log my hours on my work calendar to make sure I worked 35-45 hours a week and it helped me be a better steward of my time. I have to find a balance between painting, blogging, photographing my work, editing the photos, researching and applying to shows, updating and maintaining my website, advertising, planning, emails, twitter and other types of networking. But its interesting because every day is a little different, some days are for beginning way too many pieces at once, and other days are for finishing touches. Sabrina Ward Harrison was the first artist that made me want to be an artist. Her work is playful, whimsical, something you can really relate to. She makes books, paintings, does photography, teaches workshops and I remember thinking that I would LOVE to have a job where I got to do so many different things like that and inspire and help others in the process. My husband, Loyd, is my biggest encouragement and my constant reminder to dream big and keep moving forward. Being self-employed can be exhausting and sometimes I just need someone else to help make decisions and bounce ideas off of so often times for me, Loyd is inspiration to embrace new challenges, pursue new ideas and directions. I am not sure I could choose just one more artist who inspires me, lately my favorites have been Fran Skiles, Joan Snyder, Sidonie Villere, and Harry Ally. I absolutely love to cook and have friends over, I easily flow from creating in my studio to cooking dinner or baking something for a big get together. I also nanny on the side and this is a fun way to get out of my isolated studio and be playful. I teach in the Summer at a children’s art camp, I really enjoy this, it is always like a retreat from the pressures I put on myself which inspires new directions and ideas. I never thought I would enjoy teaching the way that I do, but I have come to love it. I teach workshops to adults occasionally as well do art workshop tours annually. It is inspiring to see other people realize their creativity. Nothing about my life is perfect routine because my husband is a musician so neither of us are on a regular 9-5 workday schedule. But I work a little bit every day and tend to be a workaholic when he is gone and a bit more relaxed when he is home so we can spend time together. I love being a hostess and having people over, when he is gone I invite girlfriends over for dinner and cook for them. I am a bit of a home body and I think this helps my work because I rarely feel stir crazy in my studio like some other artists or friends I know who work from home. I almost hate having something every day in one week because I feel like it interrupts my flow of working. I usually paint and create for a while and make a huge mess, frequently go on cleaning binges that often give me more energy in the studio, when I get stuck in the afternoon, I go work out, cook and eat dinner with Loyd and then usually go back to working randomly throughout the evening. Thank you Deeann, such an insightful and honest interview. I cannot wait to see what comes next and definitely hope to work with her in the future. Until next time keep sticthing! What wonderful work, I love it.